Sarees have been the most appealing form of dressing for women in India since ancient times. The deep rooted association with the rich traditional Indian culture makes sari one of the most widely accepted and favored clothing among Indian women. India has been a land a customs and festivals. Since ages, Indian women have been considered as the most demure ones in the world. Their beauty and the way they carry themselves with elegance and poise are known and respected across the world. Indian women are synonymous with sarees because most of them have been adorning them with pride. Sarees have been the only attire for married women in most Indian communities. When a girl becomes a woman after marriage, there is a transformation in her overall personality that is enhanced with the beautiful sarees that she wears along with other accessories. It is a matter of delight for any woman to wear a Saree, it makes her feel complete. In today’s India, there is a lot of influence of western culture among people. Women are not just managing homes now; they are more educated and empowered. The younger generation of educated women is career-oriented and wants to make their presence felt in every sector. The exposure to other cultures and lifestyles has broadened their mind to embrace global trends in fashion. However, they have not forgotten their roots and have been able to create a balanced approach in defining contemporary lifestyle where both Indian and Western styles are blended in harmony. Sarees are still one of the major attractions of clothing for young modern Indian women. 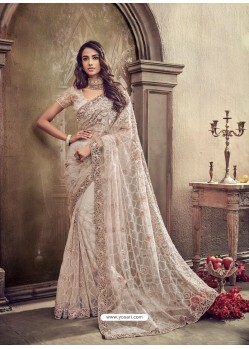 In fact, the demand for sarees have been ever-growing, as they are a unique form of dressing that is found nowhere in the world. A Saree can make a woman look highly stylish, glamorous and yet charmingly beautiful on any occasion. The most important factor about a Saree is that it is a very flexible wear and can blend in for any purpose. It is commonly used as a daily wear for married women. Additionally, it can be worn as a formal dressing for working women as well as for parties, festivals, weddings and any other social event. In major festivals like Diwali, Ganesh Chaturthi, Durga Puja, Karva Chauth etc., sarees are in huge demand, as they are the most favored form of dressing for women. Even on weddings, shopping is not complete without designer sarees with variety of colors and an array of embellishment on them. YOSARI deals in beautifully designed party wear sarees that are ideal for any occasion to make women feel special and attractive. With a wide spectrum of festivals and other important social and professional events, party wear sarees have their own importance. Indian marriages are not just a day’s affair. They last for a few days with various kinds of customs, rituals along with sessions of dancing and singing. Women love to flaunt their designer party wear sarees on these instances to stand out in the crowd. When it comes to exclusive sarees, they are made with a large mixture of fine and pure fabrics. A lot of innovative materials are also used where two fabrics are blended to create a new texture. The choice is boundless for women, as they can choose from materials like chiffon, jacquard, net, satin, georgette, silk, brasso, and velvet. Also among other popular ones are, cotton silk, jute silk, kanjivaram silk etc. Innumerable designs and patterns in party wear sarees are available at YOSARI. These comfortable high quality materials are further decorated with rich traditional designs to give them a distinctive look. Conventional, centuries old works like zari, zardosi, kundan, patch and cut works, sequins, embroidery, mirror, resham are always in vogue and demand for an ideal party wear Saree. They are also available in diverse, enchanting prints and motifs. Decorative materials like beads, stones, and velvet borders enhance the look of these exquisite sarees that make women feel delighted and enchanted. A lot of fresh styles of draping this garment have also become popular with changing times. The leading fashion designers, with their innovative and creative minds, have been successful in taking this attire to the global platform, which has created a huge demand for the outfit around the world. New patterns and cuts in blouses give a whole new meaning to these designer Sarees. These stylishly designed modern blouses make women look very trendy and glamorous. With the right kind of jewelry and other fashion accessories, this outfit can make a woman feel and look royally gorgeous. They give women a lot of scope to experiment with their looks and explore their sensuality in different ways. The range of colors of these fashionable sarees is stupefying. At yosari.com, you will get an exclusively designed assortment of party wear sarees in various attractive shades like pink, red, blue, green, yellow, white, purple, black, beige, orange, grey, turquoise, wine etc. These garments are of top-notch quality and the materials used are very comfortable and light to wear. We ship across India and also cater to the ever-growing demand for our high-quality party wear sarees in countries like USA, UK, Canada, and Australia. Browse our portal, which has an extensive collection of party wear sarees in various fascinating designs and patterns for you to select for any occasion and festivals. We are specialized in making you feel and look elegantly beautiful with our enthralling range of party wear sarees. Select and order one for yourself or as a gift for someone special. SHOP NOW!